I am using Buzzom to manage my twitter account. Thanks to its open-ended design and a thriving user community, Twitter is fast outgrowing its roots as a simple, easy-to-use messaging service. Enterprising hackers are creating apps for sharing music and videos, to help you quit smoking and lose weight  spontaneously extending the text-based service into one of the webs most fertile (and least likely) application platforms. Hardware hackers have set up household appliances to send status alerts over Twitter, like a washing machine that tweets when the spin cycle is through, or a home security system that tweets whenever it senses movement inside the house. 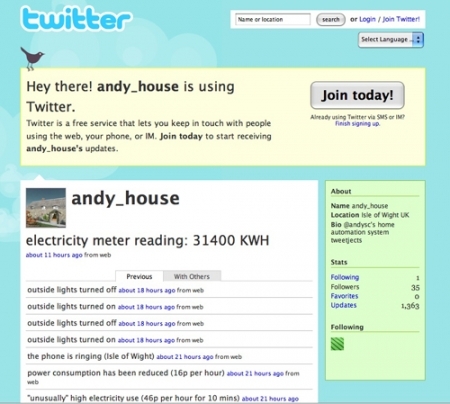 Others have incorporated Twitter into their DIY home automation systems. Forgot to turn off the lights? Send a tweet to flip the switch by remote control. “Its so simple and easy to access, people are thinking of more and more uses for the platform,” says Dan Wasyluk, creator of the Twitter-based Snipt service. Wasyluk launched Snipt last week as a way to let programmers share short snippets of code over Twitter. Launched in 2007, Twitter quickly became a darling of the life- and mind-casting interneterati. But some saw boundless possibilities in the 140-character limit, and what was a slow trickle of innovation is now quickly elevating what is essentially a micro-blogging service into one of the internets most important technologies, along with instant messaging and e-mail. Though its main use  sending and receiving short messages to your social network  is often dismissed as time-wasting trivia, Twitters potential as a broad internet platform is just beginning to be fully realized. Twitter has grown into a ubiquitous presence  you can send tweets from your phone, your desktop and your browser  that has potential to not only facilitate communication among humans, but even to make machines do our bidding. Businesses are starting to be built around it. Botanicalls, for example, sells a Twitter-enabled hardware kit that lets your neglected house plants alert you when theyre thirsty. The company has developed a tiny moisture sensor attached to a circuit board with an Ethernet port. You stick it in your plants soil, and when the moisture levels drop below a certain level, your plant sends you a tweet begging to be watered. Using Twitters application programming interface (API), a programmer with even a modest amount of experience can create a web app that gathers public data from Twitter, or uses it to send links, commands or bursts of information. “[Twitter’s] open API is a huge reason it has grown into such a platform,” says Wasyluk. File sharers were the first to rush in. The photo-sharing service TwitPic, one of the oldest Twitter mashups, lets users send pictures to their followers by storing a photo on its servers, then passing the link around on Twitter. Now there are newer apps like Tweetcube and Twittershare, which let users share larger media like MP3s and videos. Twitters limited format of short, text-based announcements are a natural match for sites like TrackThis, which you can use to get status updates on FedEx and UPS packages, and Tweetajob, which job seekers can use to get real-time updates about new job openings. Anyone who needs help quitting smoking can use Qwitter to monitor their progress. Those looking to lose weight can turn to TweetWhatYouEat or TweetYourEats. Hardware hackers have put a new spin on the Twitter mashup  as it turns out, just about anything that can be plugged into the internet is capable of talking to Twitter. Programmer Ryan Rose rigged up his washing machine to send him a tweet when his clothes are done. He just follows his machines twitter account (its PiMPY3WASH) and he knows when to go downstairs and move his undies to the dryer. Linux hacker Shantanu Goel set up a video camera and some motion-sensing software on a PC connected to the internet. If anyone breaks into his house or goes snooping through his room, the software detects the movement and sends out a tweet. Tech-savvy environmentalists can install Tweet-a-Watt, a gadget that plugs into your wall socket and connects to your wi-fi network. Once a day, the pocket-sized device broadcasts stats of your daily energy usage to Twitter. Whether that sort of transparency results in embarrassment or bragging rights can be determined by a system like the one created by Justin Wickett. The Duke University student wired up his home so he could turn his lights on and off remotely, just by sending a text message to Twitter from his mobile phone. We’ve had the connected home available for sometime now. With home automation connected to the internet, and able to report and control devices on site and remotely from any internet enabled device (PC or cell/mobile device). But this the first report of a house connected to the social network; Twitter. Home improvement is gaining a new connected visual dimension. One house twitters about its energy usage, another posts every item in its refrigerator and dozens more provide live data on how much electricity their solar panels are generating. An increasing number of homeowners are installing monitors on their houses that broadcast information on the Internet about the physical environment in and around where the houses sit. This revolution is being led by infotech guys like the Google engineer we wrote about, or the creator of the Twitter system, Andy Stanford-Clark, who works for IBMs Pervasive and Advanced Messaging Technologies team. And as Katie Fehrenbacher noted over at Earth2Tech, the creators of Flash are now hard at work on an energy monitoring and automation system called Greenbox.